When viewed under a microscope, this tiny grain of asteroid dirt kind of looks like a human hair. Japan's Hayabusa spacecraft collected this sample of the asteroid Itokawa in 2005 and returned it to Earth in 2010. 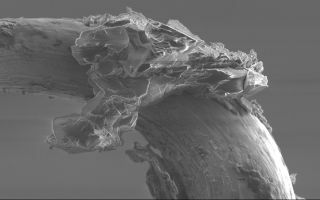 A grain of asteroid dust observed under a microscope looks like a weird strand of "extraterrestrial" hair. Japan's Hayabusa spacecraft fetched this small speck of asteroid 25143 Itokawa during the first-ever asteroid sample return mission 13 years ago. "Extremely precious, these Hayabusa grains have become the focus of scientific study around the world," European Space Agency (ESA) officials said in a statement. With this particular sample, ESA scientist Fabrice Cipriani is researching the static charging properties of the material "to understand the consequences for the surface environments of asteroids," ESA officials said. Because asteroids do not have atmospheres, their surfaces are exposed to solar wind — a stream of charged particles that flows from the sun. "Those charged particles deposit charges into the material" on the asteroid's outer surface, Cipriani said in a video. Static electricity can repel these tiny asteroid particles from one another, and Cipriani is studying how those interactions can affect the structure of an asteroid. "The porosity or the density of the material can be a bit different from what we think it is if we do not include this component of the forces" in scientific models of asteroids, Cipriani said. "The way the layers are held together, especially if the asteroid body is very small, is affected." To recreate the space weather environment for asteroid particles in a laboratory, Cipriani and his team of researchers place the grains inside a test chamber where they "bombard them with electrons and measure the amount of charges which are accumulating on the surface, and how those charges distribute on the surface," he said. The grains are extremely small; this one has a diameter of 40.95 microns, which is roughly the average width of a human hair. These asteroid particles also "have very sharp edges ... because they haven't been weathered by water or eroded by water like on Earth," Cipriani said. However, tiny cracks and "microcraters" can be found on the grains — and that is likely a result of the asteroid's exposure to solar wind, he added. While Cipriani and his team are studying the electrical properties of asteroid Itokawa's dust, other researchers are studying the grains to learn about the asteroid's mineralogy and composition, which scientists can use to learn about the origin of the solar system, Cipriani said.